Undergoing gender transition is a risky endeavor in these violent times. Transitioning signifies the affirmative of self and new beginnings; however, the extent to which transition can mark the start of a new life is framed by one’s social location vis-a-vis material power relations. Un(der)employment allows a glimpse into why particular bodies are rendered worthless. This article draws from my larger qualitative study addressing trans* un(der)employment in Ontario, British Columbia, and Washington State. Se soumettre à une transition de genre est une entreprise risquée à cette époque violente. La transition signifie l’affirmation de soi et de nouveaux débuts; toutefois, la mesure dans laquelle la transition peut marquer le début d’une nouvelle vie est formulée par l’emplacement social de la personne vis-à-vis des relations de pouvoir matériel. Le chômage et le sous-emploi nous donnent un aperçu de la raison pour laquelle certains corps sont rendus sans valeur. Cet article s’inspire de mon étude qualitative plus étendue portant sur le chômage et le sous-emploi parmi la population transgenre en Ontario, en Colombie-Britannique et dans l’État de Washington. Adkins, Lisa. 2012. “Out of Work or Out of Time? : Rethinking Labour after the Financial Crisis.” South Atlantic Quarterly 111 (4): 621-641. Adkins, Lisa, and Celia Lury. 1999. "The Labour of Identity: Performing Identities, Performing Economies." Economy and Society 28: 598-614. Anderson, Ben. 2009. "Affective Atmospheres." Emotion, Space and Society 2: 77-81. Berlant, Lauren. 2007. "Slow Death (Sovereignty, Obesity, Lateral Agency)." Critical Inquiry 33: 754-780. ____. 2008. Cruel Optimism. Durham, NC: Duke University Press. Brown, Wendy. 2015. Undoing the Demos. Cambridge, MA: MIT Press. Butler, Judith. 2004. Undoing Gender. New York, NY: Routledge. Clement, Wallace, Sophie Mathieu, Steven Prus, and Emre Uckardesler. 2009. "Precarious Lives in the New Economy: Comparative Intersectional Analysis." In Gender and the Contours of Precarious Employment, edited by Leah F. Vosko, Martha MacDonald, and Iain Campbell, 240-255. New York, NY: Routledge. Edelman, Elijah Adiv. 2014. "'Walking While Transgender.' Necropolitical Regulations of Trans Feminine Bodies of Colour in the Nation’s Capital." In Queer Necropolitics, edited by Jin Haritaworn, Adi Kuntsman, and Silvia Posocco, 172-190. New York, NY: Routledge. Fanelli, Carlo, and Mark P. Thomas. 2011. "Austerity, Competitiveness and Neoliberalism Redux: Ontario Responds to the Great Recession." Socialist Studies/Études socialistes 7 (1/2): 141-170. Foucault, Michel. 2008. The Birth of Biopolitics: Lectures at the College de France 1978-1979. Edited by Michel Senellart. New York, NY: Palgrave Macmillan, 2008. Garsten, Christina, and Kerstin Jacobson. 2013. "Sorting People In and Out: The Plasticity of the Categories of Employability, Work Capacity and Disability as Technologies of Government." Ephemera: Theory and Politics in Organization 13: 825-850. Hardt, Michael. 1999. "Affective Labor." Boundary 2: An International Journal of Literature and Culture 26: 89-100. Haritaworn, Jin, Adi Kuntsman, and Silvia Posocco, eds. 2014. Queer Necropolitics. New York, NY: Routledge. Haynes, Kathryn. 2012. "Body Beautiful? Gender, Identity and the Body in Professional Services Firms." Gender, Work and Organization 19: 489-507. Hochschild, Arlie Russell. 2012. The Managed Heart: Commercialization of Human Feeling. Berkeley, CA: University of California Press. Hong, Grace Kyungwon. 2012. "Existentially Surplus Women of Color Feminism and the New Crises of Capitalism." GLQ: A Journal of Lesbian and Gay Studies 18 (1): 87-106. Irving, Dan. 2015. "Performance Anxieties: Trans Women's Un (der)-employment Experiences in Post-Fordist Society." Australian Feminist Studies 30: 50-64. ____. 2016. "Future Investments: Gender Transition as a Socio-Economic Event." In The Post-Fordist Sexual Contract: Working and Living in Contingency, edited by Lisa Adkins and Maryanne Dever, 31-48. New York, NY: Palgrave Macmillan. Isin, Egin. 2004. "The Neurotic Citizen." Citizenship Studies 8: 217-235. Jensen, Tracey. "Riots, Restraint and the New Cultural Politics of Wanting." Sociological Research Online 18 (4): n.p. http://www.socresonline.org.uk/18/4/7.html. Kimmel, Michael. 2013. “Manufacturing Rage: The Cultural Construction of Aggrieved Entitlement.” In Angry White Men: American Masculinity at the End of an Era, by Michael Kimmel, 31-68. New York, NY: Nation Books. Lazzarato, Maurizio. 1996. "Immaterial Labour." In Radical Thought in Italy: Potential Politics, edited by Paolo Virno and Michael Hardt, 133-147. Minneapolis, MN: University of Minnesota Press. McDowell, Linda. 2005. "The Men and the Boys: Bankers, Burger Makers and Barman." In Spaces of Masculinity, edited by Bettina Van Hoven and Kathrin Hörschelmann, 19-30. New York, NY: Routledge. McRobbie, Angela. 2011. "Reflections on Feminism, Immaterial Labour and the Post-Fordist Regime." New Formations 70: 60-76. ____. 2015. "Notes on the Perfect: Competitive Femininity in Neoliberal Times." Australian Feminist Studies 30: 3-20. Newman, Katherine. S. 2009. No Shame in My Game: The Working Poor in the Inner City. New York, NY: Vintage. Ngai, Sianne. 2009. Ugly Feelings. Cambridge, MA: Harvard University Press. Patel, Geeta. 2006. "Risky Subjects: Insurance, Sexuality, and Capital." Social Text 89: 25-65. Perrons, Diane, Collette Fagan, Linda McDowell, Keth Ray, and Kevin Ward. 2005. "Work, Life and Time in the New Economy: An Introduction." Time and Society 14: 51-64. Puar, Jasbir K. 2012. "Coda: The Cost of Getting Better. Suicide, Sensation, Switchpoints." GLQ: A Journal of Lesbian and Gay Studies 18 (1): 149-158. Rau, Alexandra. 2013. "Psychopolitics at Work: The Subjective Turn in Labour and the Question of Feminization." Equality, Diversity and Inclusion: An International Journal 32: 604-614. Schilt, Kristen. 2010. Just One of the Guys? : Transgender Men and the Persistence of Gender Inequality. Chicago, IL: University of Chicago Press. Shapiro, Michael J. 2011. "The Moralized Economy in Hard Times." Theory & Event 14 (4): n.p. Skeggs, Beverly. 2011. "Imagining Personhood Differently: Person Value and Autonomous Working Class Value Practices." The Sociological Review 59: 496-513. Stroud, Angela. 2012. "Good Guys with Guns: Hegemonic Masculinity and Concealed Handguns." Gender & Society 26 (2): 216-238. Vosko, Leah F., and Lisa F. Clark. 2009. 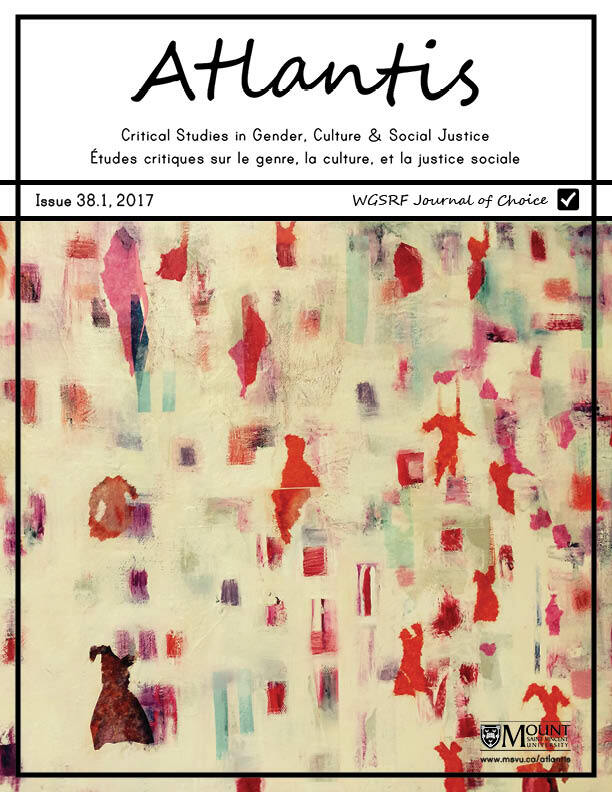 "Canada: Gendered Precariousness and Social Reproduction." In Gender and the Contours of Precarious Employment, edited by Leah F. Vosko, Martha Macdonald, and Iain Campbell, 26-42. New York, MY: Routledge, 2009.